Most industrial applications found in any manufacturing plant subject the electrical cable to harsh environments like abrasion, impact, vibration, flexing, pulling, oil, water, chemicals and even inclement weather. 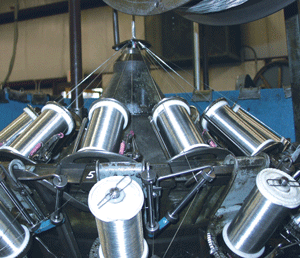 The design and development of the cable for specific applications can require a lot of detail. Why is it failing? Explain in detail what is happening with your current cable. How flexible does the cable need to be? What material type are the conductors? Bare copper, tinned copper, silver copper or nickel? What is the material type and wall thickness of the insulation? Is there any shielding, and if so what is the shield and material type? What is the material type, maximum O.D and wall thickness of the jacket? Does the cable jacket need to be a specific color? What regulatory standards does the cable meet? UL, CSA, CE, MIL SPEC or other? Is anything printed on the cable jacket? Keeping your machinery running efficiently and safely with less downtime is possible with the right cable. If your original cable isn't cutting it in your industrial application, a custom designed cable may be the best option for you. Stop continually repairing and replacing your cable and build a custom cable that lasts. Get started today by downloading our Custom Designed & Engineered Wire & Cable Solutions brochure.